Switzerland is known for its neutrality. A country is neutral when it does not take sides among the countries who are at war. Switzerland has been neutral for more than 190 years. Many international organizations are in Switzerland. The United Nations has a main office (but not its headquarters) in Geneva. Its predecessor organization, the League of Nations, was headquartered in Geneva. There are many lakes in Switzerland. The biggest lakes are: Lake Geneva (Lac Léman), Lake Zürich, Lake Neuchâtel and Lake Constance (Bodensee). There are no mountains in the north of Switzerland. This caused many cities and towns to be built in the north. The Jura mountains are in the northwest of Switzerland. There are about 8 million people in Switzerland. About 64% of the people speak German as their first language, in northern and central Switzerland. 19% of the people speak French as their first language, in the west of Switzerland. 8% of the people speak Italian, in the south of Switzerland. 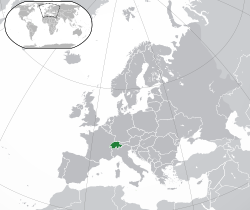 Only 1% of the people speak Romansh, in the southeastern part of Switzerland. Romansh is an old language that is similar to Latin. People from other areas signed the contract and joined the Eternal Alliance. More and more people worked together to be free. In 1648, other countries from Europe made an agreement that Switzerland was free. The name of this agreement was the Treaty of Westphalia. More areas came to be part of Switzerland. In 1798, the military from France invaded Switzerland. The ruler of France was Napoleon. He changed many laws. In 1815 Switzerland again became free from France. Other countries made an agreement that Switzerland was free. The name of this agreement was the Congress of Vienna. It also said that Switzerland was neutral. The constitution of Switzerland that was made in 1848 was replaced in 1999. Switzerland did not fight in World War I or World War II. Since 2002, Switzerland is part of the United Nations. It did not join the United Nations for 57 years because of its neutrality. Heidi, a book for children by Johanna Spyri, is the most famous book of Switzerland. It is located in the mountains in Graubünden. Skiing, snowboarding and mountaineering are among the most popular sports in Switzerland. The nature of the country is well suited for such activities. Bobsleigh was invented in St. Moritz. The first world ski championships were held in Mürren (1931) and St. Moritz (1934). St. Moritz hosted the second Winter Olympic Games in 1928 and in 1948. Among the most successful skiers and world champions are Pirmin Zurbriggen and Didier Cuche. ↑ "Population size and population composition". Swiss Federal Statistical Office. Swiss Federal Statistical Office, Neuchâtel. 2010. http://www.bfs.admin.ch/bfs/portal/en/index/themen/01/02/blank/key/bevoelkerungsstand.html. Retrieved 2011-04-29. ↑ 4.0 4.1 4.2 4.3 "Switzerland". International Monetary Fund. http://www.imf.org/external/pubs/ft/weo/2010/01/weodata/weorept.aspx?sy=2007&ey=2010&scsm=1&ssd=1&sort=country&ds=.&br=1&c=146&s=NGDPD%2CNGDPDPC%2CPPPGDP%2CPPPPC%2CLP&grp=0&a=&pr.x=84&pr.y=8. Retrieved 2010-04-21. ↑ "Human Development Report 2010". United Nations. 2010. Archived from the original on 8 November 2010. http://web.archive.org/web/20101108160356/http://hdr.undp.org/en/media/HDR_2010_EN_Complete.pdf. Retrieved 4 November 2010. ↑ "Neutrality and isolationism - Switzerland - Information". swissworld.org. http://www.swissworld.org/en/politics/foreign_policy/neutrality_and_isolationism/. Retrieved March 27, 2010. ↑ Swiss Federal Statistical Office. "Languages and religions - Data, indicators". http://www.bfs.admin.ch/bfs/portal/en/index/themen/01/05/blank/key/sprachen.html. Retrieved 2007-10-09. The first number refers to the share of languages within total population. The second refers to the Swiss citizens only. ↑ "Swiss Literature". admin.ch. http://ead.nb.admin.ch/web/swissinfodesk/cultl-en.html. Retrieved 2008-03-04. ↑ "IIHF World Championships 2009 official website". Iihf.com. 2009-05-10. http://www.iihf.com/channels/iihf-world-championship-oc09/home-oc/tournament-information.html. Retrieved 2010-04-29. ↑ Geering. "Hockeyarenas.net". Hockeyarenas.net. http://www.hockeyarenas.net/index.php3?ctID=ch&size=0&page=0701&c=eu&ctID=eu&atType=0&show=25&tdSaison=2011. Retrieved 2011-11-03. ↑ "Switzerland lifts ban on motor racing". GrandPrix.com & DueMotori.com. 6 June 2007. http://en.wikinews.org/wiki/Switzerland_lifts_ban_on_motor_racing. Retrieved 23 September 2008. This page was last changed on 26 November 2014, at 13:03.